Innovative Display and Design worked in collaboration between Make Be-Leaves and their booth designers to produce custom framed green wall panels for Konica Expo in Carlsbad. 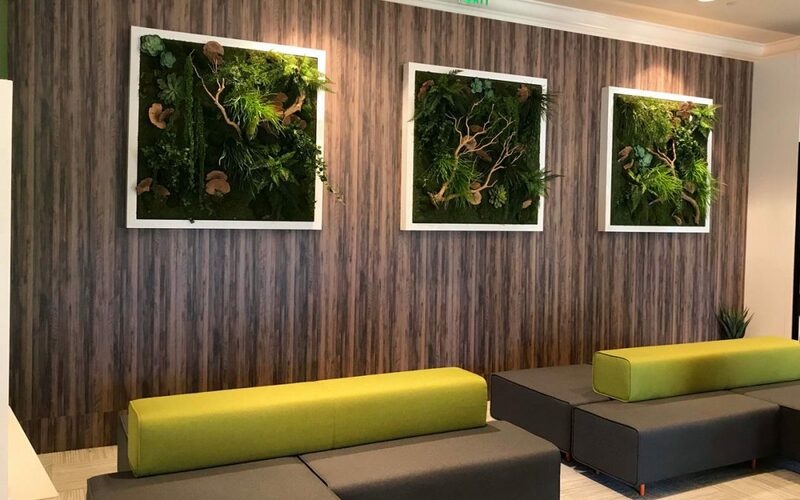 Based on inspiration images provided by the designers, Make Be-Leaves selected a combination of natural sandblasted manzanita wood branches, artificial ferns, faux grasses and mosses to create the these green wall panels. 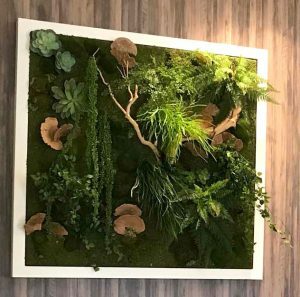 The panels were constructed on a styrofoam base, with preserved moss wrapped around the entire base of the panels – including the edges, which worked perfectly to fit into the customer’s white frames. Originally, the designers requested 5 ft x 5 ft. panels, but due to tight budget parameters, we recommended scaling the size panels to 4 ft. x 4 ft. – which succeeded in maintaining the design intent and impact on the space, while meeting their budget. Make Be-Leaves is great at “value-engineering” – knowing how to preserve the same high quality artificial plantscape design, while making minor revisions to meet tight budgets.